Batman: The Dark Knight Strikes Again, Frank Miller and Lynn Varley, DC Comics, 2002, ISBN 9781563899294, 248pp. Unlike a fair number of people, I enjoyed Frank Miller’s return to the world of his groundbreaking Batman: The Dark Knight Returns. It’s not the same work, it’s not even the same world, but Miller hasn’t lost his ability to be both provocative and interesting. This is a true example of the DC “Elseworlds” concept–this is not the Bob Kane Batman, nor is it the Siegel and Shuster Superman. Instead, every character here is revisioned and recreated by Miller to fit the story and the themes that he wants to explore. The problem with this graphic novel, and what has turned a lot of Miller fans against this book, is that it breaks down in the last book, delayed in its original publication because of the events of September 11. 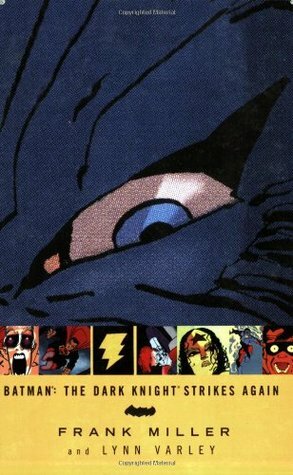 Maybe it’s because I didn’t read the book as it came out in its installments that this didn’t feel like that much of a break to me, for even in the earliest moments of this graphic novel, Miller’s disdain for authority, especially that of governmental “big brotherness,” is readily apparent. If it becomes even more over the top at the end, why that seems just a natural extension of how the book starts. What The Dark Knight Strikes Again reminds me the most of is Howard Chaykin’s wonderful 1980s comic, American Flagg!, that was quite prescient in its vision of a world of reality TV and police-for-hire. Miller’s extrapolation of current news-as-entertainment and rock-stars-as-political-gadflies doesn’t seem all that wild in comparison. Outside of comics, the quick comparison for this volume is to John Varley’s thinly veiled diatribe against the Hollywood system in the third volume of his Gaia trilogy, Demon. Like Varley, Miller’s got a hefty axe to grind, and he swings with some impact against such easy targets as John Ashcroft and the television media. With each successive project, Frank Miller’s artwork has gotten more crude and yet more expressive. I believe his writing has as well. There’s a rawness here that is quite emotional and yet so raw that you wonder if it ever saw an editor. It’s rare to see such an individual expression of belief in a superhero comic, where most of what we see is company-produced on the assembly line. I hope we get to see more of this kind of thing, even if it produces the kind of mixed response that has greeted this particular work. Postscript 2014: Timothy Burke commented on this to say that he thought the American Flagg! 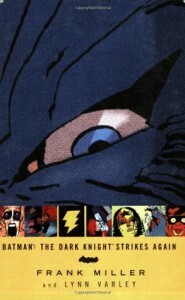 comparison was better to Batman: The Dark Knight Returns than this book, for “an artist/writer at the height of his powers, working on something that perfectly summarizes and encapsulates the themes and obsessions that had been brewing in his work up to that point.” Both Miller and Chaykin’s work, after those peaks, had been highly disappointing to Tim. He went on to suggest that perhaps Miller should stay away from the superhero genre if he can’t find anything in it that he likes. I never felt that Miller cared much for the superhero genre in the first place. You look at his earliest work in Daredevil and the first thing Miller does is remove any sort of superpowers that Daredevil had so that he can play around with the character’s psyche. Miller doesn’t display the kind of fannish respect for the characters of someone like, say, Kurt Busiek or Mark Waid, nor does he show an intellectual respect for them that would come from someone like Alan Moore or Grant Morrison. To Miller, the characters become vehicles to propel his ideas and beliefs, more of a battle of id vs. ego. Or, to move this from the abstract to the real, while I disagreed with Miller’s portrayal of Superman in The Dark Knight Strikes Back (i.e., it doesn’t ring true to me that Superman would allow himself to be blackmailed in such a way by Luther and Brainiac), I’m willing to see it instead as the idea of those who believe that saving lives is important than living life (or, to put it another way, it’s better to live in an Orwellian dystopia than not living at all). Batman presents the opposite extreme; the unbending desire for freedom. It’s a philosophy that may be flawed, but I found it an interesting moral play to be used with these two modern mythological figures. DK2 does fall apart somewhat in the third chapter, in precisely the same manner that John Varley’s trilogy did, but that doesn’t mean it wasn’t interesting, and I thought much more rewarding than even Morrison’s The Invisibles, which took ten times as long to slog through some of the same concepts as DK2–and less effectively. But I totally agree with Tim about Howard Chaykin–everything he’s done since American Flagg!, including American Century, has been a real disappointment. I keep hoping he’ll find that “perfect note” like before. DK2 may not be Miller’s perfect note either, but it’s more of the off-pitch of a post-punk band than someone who’s lost their entire tonal ability.